Decorating with black has always seemed a rather brave concept to me. But Stairrods (UK) has just brought out its comprehensive range of flooring trims in a fabulous matt black and I’ve done a U-turn! After all, wrought iron black has been part of our decorative mix for centuries. 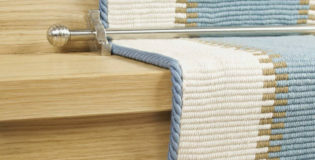 So, the new black flooring trims featured on our Shopping site are available. There are some excellent tips on decorating with black on the internet. Emily Senior at House and Garden has recently urged us not be ‘afraid of the dark’ and put together an inspiring collection of black or dark, moody interiors. I love the contemporary styled carpet in this bedroom, which features a black design on oatmeal background. Our new black carpet bars, located in the doorway onto a landing or ensuite bathroom, would look just the part. I can also imagine a smart matt black door threshold would work well with the black marble hearth featured in this drawing room. A touch of black here and there, echoing the mood of the deep red walls and paintwork, helps to set the warm feel of the room. The idea of using black as a trim is something which Cassity on the blog remodelaholic explores at some length. Matching up the finishes of your accessories in the same room or floor of a home is a popular idea. So, if you have black cabinet door handles, light fittings, stair rods or shelving, then selecting a black door trim can create a stunning contemporary feel. She suggests a whole lot more black accents in the home, including window mouldings, picture frames, tiles, splashbacks and the like. My own favourite is this one (below), which features on-trend geometric black and white floor tiles. The contrast of the crisply defined, geometric floor tiles makes a stunning contrast with the smoky, charcoal coloured cabinets. Our stick down Euro Cover strips or the minimalist T Bars would work a treat on these. Our new Premier Trims in black feature a sandblasted finish, which is more like a matt appearance, lightly textured and ultra sophisticated. To purchase, visit the CarpetRunners.co.uk main shopping site. 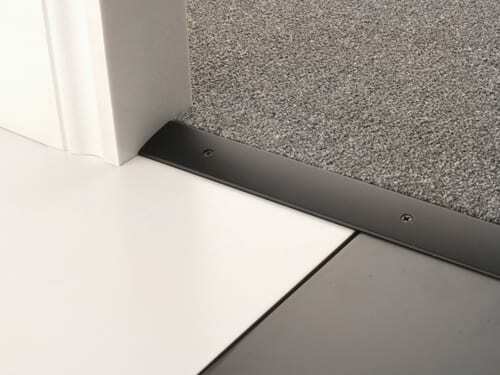 Black is available in many of our Flooring Trims and Carpet Thresholds.